We owe such a lot to the humble European honeybee. For an insect that was only brought to Australia in 1822, it has become well-established as one of our most important crop-pollinating insects. But honeybees are under threat from pests and environmental changes that have caused widespread colony collapse around the world. That’s one reason why there’s growing interest in Australia’s native pollinators that keep our food and natural ecosystems ticking along. Australian Pollinator Week is all about raising awareness of the important role of pollinators so that we can look after them and ensure they are ready to pollinate our orchards, fields and forests. Native bees: with around 2000 species of native bees in Australia, these little beauties are well-adapted to our native flowers and many are surprisingly active on our fruit crops. Many of them live on their own in the ground or in plant stems – you can even build them a home with a Bee Hotel. Flying Foxes: these nocturnal pollinators love the sweet nectar of native flowers. Flying foxes can be absolutely covered in pollen and are essential in the health of native forest ecosystems and as pollinators. Flies and Butterflies: even those pesky blowflies that bother us in summer are actually important pollinators – in fact, they are important pollinators of avocadoes and coffee plants! Your Saturday brunch just wouldn’t be the same without them! Moths: flowers of some fruit crops like Pawpaw only open at night and attract moths as pollinators. Moth-pollinated flowers are often white or translucent and can be fragrant to attract moths by their scent. Birds: Many native bird favourites such as lorikeets and honeyeaters perform pollination services for native plants, often emerging covered in pollen that they move between flowers as they feed on the nectar of native trees. “Around the world, European honeybees have been severely affected by pests like the Varroa mite, loss of flowers for food and nesting habitat, and climate-change events such as increasing drought”, explains Professor Cook. “That’s why it’s so important that we all look after the wide variety of pollinators that live in Australia by giving them food, shelter and habitat. It’s for our own food security too, as well as their survival”. Australian Pollinator Week runs from the 11th -18th November 2018. 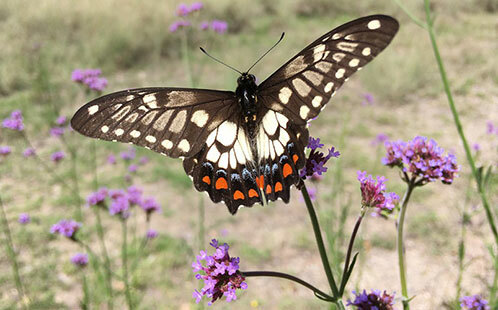 It was established in 2015 by Western Sydney University alumnus, Dr Megan Halcroft, to acknowledge our important and unique insect pollinators during our southern spring (November). It is a designated week when community, business and organisations can come together to raise awareness of the importance of pollinators and support their needs. Western Sydney University’s Pollination Research is funded by the Hort Frontiers Pollination Fund, part of the Hort Frontiers strategic partnership initiative developed by Hort Innovation, with co-investment from Western Sydney University, OLAM, Syngenta Asia-Pacific, Bayer CropScience and Greening Australia, and contributions from the Australian Government.